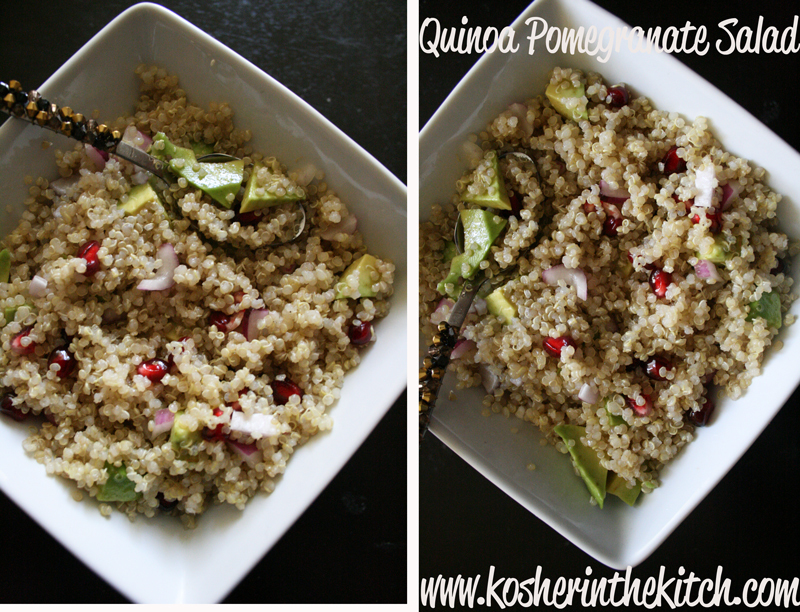 Quinoa Salad with Avocado and Pomegranate Seeds - Kosher In The Kitch! Quinoa Salad with Avocado and Pomegranate Seeds - Kosher In The Kitch! Quinoa is the perfect base for a salad since it’s hearty and filling and can be paired with any dressing. This once is sweet with a slight tart kick. The pomegranate seeds give it a nice crunch. Cook quinoa as directed on packaging, using chicken stock in place of water. Once cooked, combine in a large bowl with avocado, red onion and pomegranate seeds. Prepare dressing by mixing together the oil, vinegar, brown sugar, garlic, salt, pepper and juice of 1 lime. Add dressing to quinoa salad and mix well. I am not using white sugar or brown sugar. Could I substitute apple juice concentrate or agave syrup for the brown sugar? I have never tried it, let me know how it tastes! how far in advance can you prepare this?